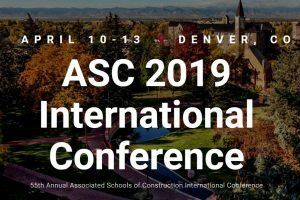 On Friday, April 12th, VERTEX CEO, Bill McConnell, will be presenting at the ASC 2019 International Conference along with Carloine Clevenger, Assistant Director of Construction Engineering and Management at University of Colorado Denver. Learn more about VERTEX’s educational partnership with University of Colorado Denver. Join industry professionals who will discuss up-to-date curricula, best teaching practices, and current management models in the construction industry. Associated Schools of Construction (ASC) is an organization of educators and industry practitioners working together for the development and advancement of construction education. It promotes the sharing of ideas and knowledge and inspires, guides, and promotes excellence in curricula, teaching, research, and service.